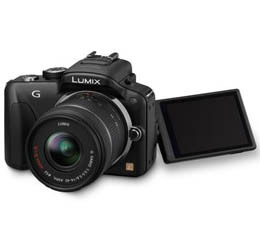 Panasonics LUMIX DMC-G3 offers the benefits of a DSLR interchangeable lens system camera with a point-and-shoot cameras compactness, light weight and simplicity. This reduction in size and weight is thanks to advancements in mirror-free viewfinder technology, and large DSLR format sensors that are more compatible with a new class of compact Micro Four Thirds (MFT) System lenses. This new class of Compact System Cameras (CSC) offers a weight and compactness not seen in traditional DSLRs, for greater portability and creative control. The DMC-G3 image resolution has been upgraded to 16.0 Megapixels from it predecessor the DMC-G2.